Let this slide in your public speaking presentation PowerPoint introduce the points you’re going to cover. In this slide of your public speaking PPT template you can tell a story about your problems with public speaking. This setup will be a prelude to the company’s services. I once had difficulty speaking in front of a crowd. One could say that the usual symptoms afflicted me sweaty palms cold sweat butterflies in my tummy. Back then I never thought I would get over the anxiety. Then I tried something out. Let me tell you about it. A short description of your company and what you do is a must for every public speaking PowerPoint presentation. 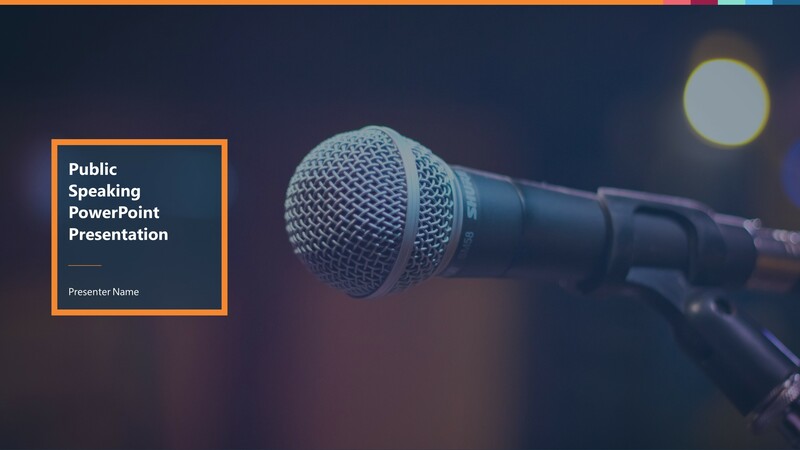 Committed to serve our clients and society in general and to improve the industry with innovations breakthroughs and general awareness we are a rising name in the speaker training industry. With lessons learned from the best names in the field we make sure we only provide the best service to clients. Discuss business opportunities in your public speaking ppt template to give potential clients a guarantee of your business’ tenacity. Studies have shown that there is a growing demand for companies like us in the speaker training industry. As long as the industrial trends remain positive the future of public speaking will be geared towards a path where businesses can thrive and succeed. Discuss in your public speaking PowerPoint presentation the different problems you aim to solve. A company executive needed the services we offer to help address the issues he was facing. The Solution slide for your public speaking. PowerPoint presentations should ideally follow your Problem slide. Make sure your proposed solutions are feasible and effective. We offered him our patented speaker training system to help solve his problems. Your potential clients would want to know how effective your proposed solutions are. That’s why it’s important to include real time results in your public speaking ppt slides. If there s a part in your public speaking slides that is best explained visually don t hesitate to use visual aids like diagrams charts and infographics among others. A real life story of you solving the problem of a client is a testament of your services. Regale your audience with a case study slide in your public speaking ppt template. A company executive needed the services we offer to help address the issues he was facing. A real life story of you solving the problem of a client is a testament of your services. Regale your audience with a case study slide in your public speaking ppt free download. A coach needed the services we offer to help address the issues she was facing. We offered her our patented speaker training system to help solve her problems. As a result of the solutions we offered the coach saw an improvement in her skills. A real life story of you solving the problem of a client is a testament of your services. Regale your audience with a case study slide in your public speaking PowerPoint presentation. As with life you can also take a break in your presentation. For either suspense or as an ender divider slides are welcome in a public speaking presentation PowerPoint. Outlining and enumerating your achievements will substantiate and solidify your company. That part of your public speaking PowerPoint presentations can have four to six points. Before you end your public speaking slides give your audience a way to contact you. Provide your email address and phone number or if traditional your physical address for snail mails. Always thank the audience for lending you their time. This part should be found in the last slide of your public speaking ppt template.